Everybody needs money. 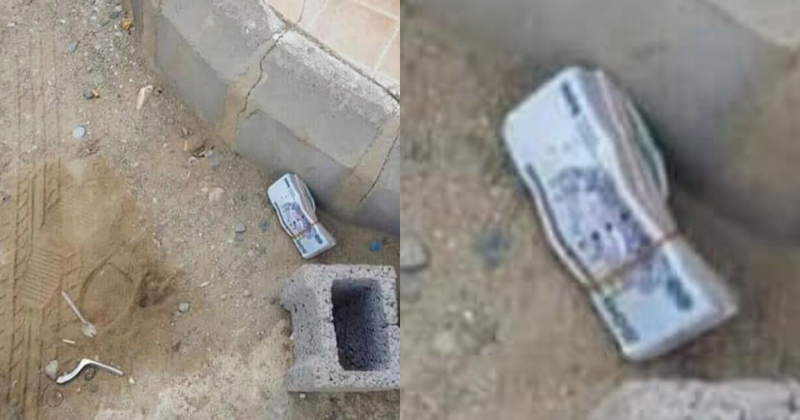 So when one finds a bundle of money lying on the ground, it is just normal that the first instinct is to pick it up, whether to return it or sometimes to keep it for one's self. But one OFW from Saudi alerts the public for doing just that. He posted his experience in Facebook where he saw a bundle of money on the ground by the parking lot where he parked his car. Thankfully, he did not pick up the money because of what happened next. 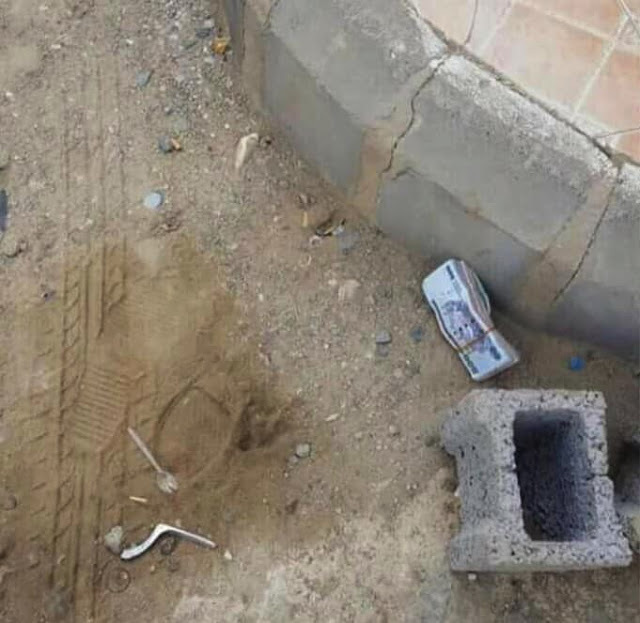 According to Suante Aguirre's post, when he parked his car one morning, he saw a bundle of money wrapped by a rubber band on the ground by his car. According to him, he did not even think about picking it up, and he was glad he didn't. According to him, not long after he walked away from the car, two foreigners approached him and asked about the money. They even threatened him that they will call the police if he did not show them his wallet. Agguire kept his mind clear and said that if they didn't stop what they were doing then he will call the police and report what they did. After that, he saw the men walk back to the place where he saw the money and pick it up. For sure to look for the next victim. 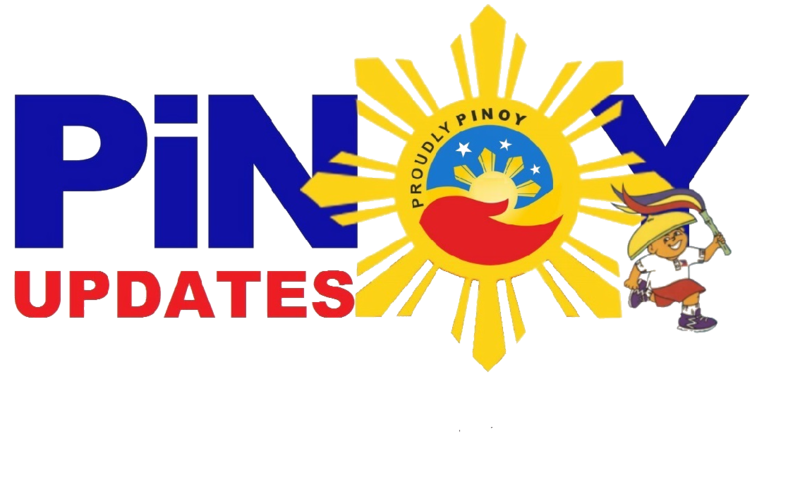 He used the post to remind the people especially his fellow OFW to be vigilant and not to fall victim to modus operandi like that. 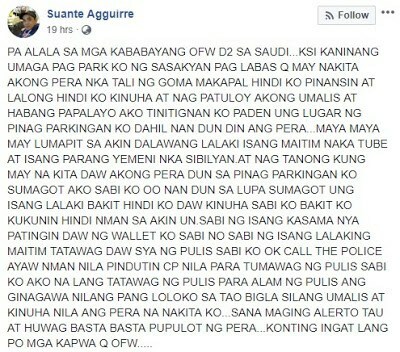 "PA ALALA SA MGA KABABAYANG OFW D2 SA SAUDI .KASI KANINANG UMAGA PAG PARK KO NG SASAKYAN PAG LABAS Q MAY NAKITA AKONG PERA NKA TALI NG GOMA MAKAPAL HINDI KO PINANSIN AT LALONG HINDI KO KINUHA AT NAG PATULOY AKONG UMALIS AT HABANG PAPALAYO AKO TINITIGNAN KO PADEN UNG LUGAR NG PINAG PARKINGAN KO DAHIL NAN DUN DIN ANG PERA...MAYA MAYA MAY LUMAPIT SA AKIN DALAWANG LALAKI ISANG MAITIM NAKA TUBE AT ISANG PARANG YEMENI NKA SIBILYAN.AT NAG TANONG KUNG MAY NA KITA DAW AKONG PERA DUN SA PINAG PARKINGAN KO SUMAGOT AKO SABI KO OO NAN DUN SA LUPA SUMAGOT UNG ISANG LALAKI BAKIT HINDI KO DAW KINUHA SABI KO BAKIT KO KUKUNIN HINDI NMAN SA AKIN UN.SABI NG ISANG KASAMA NYA PATINGIN DAW NG WALLET KO SABI NO SABI NG ISANG LALAKING MAITIM TATAWAG DAW SYA NG PULIS SABI KO OK CALL THE POLICE AYAW NMAN NILA PINDUTIN CP NILA PARA TUMAWAG NG PULIS SABI KO AKO NA LANG TATAWAG NG PULIS PARA ALAM NG PULIS ANG GINAGAWA NILANG PANG LOLOKO SA TAO BIGLA SILANG UMALIS AT KINUHA NILA ANG PERA NA NAKITA KO...SANA MAGING ALERTO TAU AT HUWAG BASTA BASTA PUPULOT NG PERA...KONTING INGAT LANG PO MGA KAPWA Q OFW."